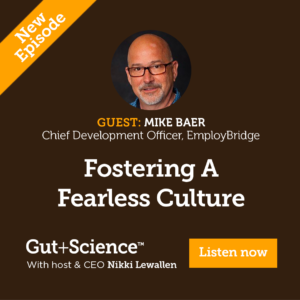 Mike Bear is a guest on the Gut Plus Science podcast discussing strategies to diagnose and treat disease in your companies culture. Hire for attitude and beliefs. Don’t hire based on competency. Skills can be trained. Beliefs—not so much. What attitude are you looking for and what kind of mindset do you need in your people? Are you clear on that? Make sure you and your team know this before your next hire. Unlock discretionary energy. There are satisfied employees, engaged employees, and then there are employees who give discretionary energy in their role. Study the discretionary energy givers in your organization, and figure out ways to unlock that energy in the rest of your team. Build confidence and eliminate fear. In a healthy culture, employees feel confident, not fearful. We all strive for this, but how often do we take measurements to know where we truly stand? Do employees feel confident? Do they feel psychologically safe? Get a baseline, and then build on it.